Quotes have been sourced for repairs to the bus shelter. Council will try to maintain the look of the shelter as it is repaired. Following representations from Council, the solicitors handling the transaction on behalf of Council have revised their fees to a reasonable amount. The purchase of the castle mound by the Council is now being finalised. Meetings have been occurring with neighbouring Parish Councils regarding replacement bus services for the area. However, there are concerns about the sustainability of the proposed replacement services. Further meetings are to be held with neighbouring parishes. Construction plans continue to progress. Council will provide updates as they become available. Funding for the renovations to the Church Hall has been secured from HS2. Additional funding will be sought from South Northamptonshire Council through the New Homes Bonus Grants to assist with the costs of the renovations. Part of the Castle Green retaining wall has been reported as requiring attention. Council will seek quotes for its repair. Council Chairperson Cllr Chris Jackson announced that he would be stepping down from the Parish Council at the conclusion of the meeting. Councillors expressed their thanks to Cllr Jackson for his outstanding work during his time on Council and as Council Chairperson. Council’s next ordinary meeting will be on 3 May 2019. The last Parish Council meeting for 2018 was well attended by villagers. The defibrillator cabinet has arrived and will be installed on the corner of Stockwell Lane and Magpie Road (at the village shop). Instructions on how to use the defibrillator will be printed in the next newsletter and training in the use of the defibrillator will be offered in November. A second training session will be offered early in the new year for villagers who missed out in November. Thanks go to Richard MacDonald from Cardiac Science for donating the defibrillator and to the South Northamptonshire District Council for a grant for the purchase and installation of the defibrillator cabinet. Mr Richard Fonge informed Council that he had cleared the pond area of the overgrown vegetation. However, the pond area had to be locked due to concerns about its safety for park users. Council will consult with the community and consider options for the pond area. Five people attended the leaf clearing on Stocks Green in October. Council is encouraging villagers to attend the next leaf clearing event on the 25th of November. Given the need for the community to take a greater role in the maintenance of the village, Council will seek suggestions from the village for activities (such as the litter pick, clearing of the Little Street footpath) that can be undertaken by the village. Council will then prioritise a few of these each year to maintain community enthusiasm and involvement. Should villagers have suggestions, they are encouraged to speak about these to a Parish Councillor. Mr Colin Wooton has placed an update on the village website regarding the changes which have been made to the Sulgrave Local Plan. Council will respond to SNC on behalf of the village. The Parish Council and the Parochial Church Council have submitted an application for funding to renovate the Church Hall. Council extended its thanks to Ingram Lloyd and Cllr Anna Faure for their work on the application. In other HS2 news, preliminary works are being undertaken along Banbury Lane and the Greatworth Road. Work on upgrading the Greatworth road junction is likely to start in early 2019 with construction of the Greatworth cutting likely to commence in the second half of 2019. Concerns were also raised about the impact of construction to the AY12 footpath. Thanks go to Mr. Colin Wooton for his updates on HS2. Cllr Priestman has undertaken further investigation into getting an illuminated speeding sign for the village. After consulting with Helmdon Parish Council on their experiences, Cllr Priestman has sought quotes from local companies for Council to consider at its next meeting. Council has not yet agreed to progress the purchase of a speed sign and will need to consider sources of funding should it wish to move forward. Cllr Priestman will also arrange a site visit from Northamptonshire Highways to discuss the potential placement of an illuminated speeding sign as well as the possibility of moving the 30 mph signs further out of the village along Helmdon Road. Council have been advised that Greatworth Parish Council and Helmdon Parish Council have partnered to provide a free weekly replacement bus service to its residents. This is costing a total of £90 per week to run, but is reportedly well used. Council considered whether Sulgrave might run a similar scheme or join the Helmdon/Greatworth scheme. However, questions were raised as to whether the need existed in the village. Council resolved to seek further information on the need for a replacement bus service in the village. As Council does not traditionally meet in December, the next meeting will be held in January 2018. If you would use a replacement bus service from the village, please answer the below questions, tear off this section and return it to a Parish Councillor. You can also return them to Cllr Daniels in Bluebell Cottage (Helmdon Road). Darker nights greeted the October Parish Council Meeting, which was attended by five villagers and Councillors (Cllr North sent her apologies). Cllr Priestman has researched the installation of an electronic speed sign in the village, holding discussions with Northants Highways and Hemldon Parish Council about their experience of installing a sign. Coucnillors agreed to progress the project and arrange a site visit to determine where a sign might be located and to obtain quotes. Council also agreed to write to Northants Highways to request that the 30 mph speed limit sign be placed further out of the village along Helmdon Rd to ensure that more of the village’s residences are included within the 30 mph zone. Mr. Richard Fonge raised concerns about the Pocket Park pond area and the need for a long term commitment to keeping the area trimmed and tidy. Mr. Fonge offered to keep the area cut back and tidy. Council gratefully accepted the offer, but noted that it was an activity that the community could be encouraged to help with. Mr. Fonge will also be removing a large and potentially dangerous tree bough within the Pocket Park. Council again expressed its thanks to Mr. Fonge. Following the successful restoration of the Park Land street sign, Mr. Robin Prior raised with Council the potential for people within the village to sponsor the restoration of other street signs around the village. Possible signs for restoration may include the Little Street, Helmdon Road and Manor Road signs. Council agreed to canvass this idea with residents. Council further discussed encouraging the village to work together to address other issues around the village. An Autumn leaf pickup on Stocks Green will be organised. Council will start gathering ideas for activities and issues which can be addressed in 2019. Council has appointed a solicitor who is working through the legal requirements to transfer the title for the Castle Mound to the Parish Council. To date, Council has received £6,000 in donations from the community. Council also received an update on the successful Michaelmas Fair from Mr. Martin Sirot-Smith of the Sulgrave History Society. He offered thanks to all involved in the organisation and running of the Michaelmas Fair and advised that an update would be provided in the village newsletter. Cllr Higginson reported that there are two more grass cuts remaining for the current year. He reported that overall, the quality of the grass cutting has been excellent and the Parish Council offered their thanks to the contractor for his work. The grass cutting contractor has provided feedback that cars parking up against or on grass verges has made the mowing difficult at times. Council will consider ways of making villagers aware of when grass cutting will occur to help with the grass cutting. Cllr Faure provided an update on the meeting with HS2 representatives which was well attended by villagers. Cllr Faure advised that the HS2 representatives were committed to doing more work in the community and would like to come back to the village with further answers and ideas. Council has agreed to keep communications open with the HS2 representatives. Council will peruse a further meeting with the HS2 representatives early in 2019. Cllr Faure also reported that work was continuing on the grant application for improvements to the Church Hall. Mr. Colin Wooton advised Council that he would be working on drawing out the implications for the village from the SNC Local Plan Part 2. He will put these on the village website for the village’s attention. Council will consider the Plan and respond as necessary. Council has agreed to follow up with surrounding villages to see how we can work together on providing a village bus service that will meet the needs of the village. Council will also look at other alternatives to meet any demand for a bus service through the village. Council noted that although some pot holes had been filled in recently, the roads within the village were deteriorating. Council agreed to keep up pressure on Northants Highways to fill in the remaining pot holes and improve the condition of the village’s roads. The Parish Council met following its summer recess. It was a pleasure to see 8 villagers join the Council for its meeting. The Sulgrave History Society continues to seek donations to help the Parish Council purchase the Castle Mound and maintain it for the benefit of the village. To date, the Sulgrave History Society has received donations from the village totalling £1070, while the Parish Council has received £300 worth of donations. Both the Sulgrave History Society and the Parish Council believe that there are now sufficient funds to move forward with the purchase of the Castle Mound. The Parish Council moved and agreed to appoint Bretherton’s of Banbury to act on the Parish Council’s behalf in the purchase of the Castle Mound. Council also discussed an approach by Sulgrave Manor to use the Castle Mound as part of their education programme. In return, the Manor has offered a nominal fee of £20 per excursion using the Castle Mound to Council to assist in the maintenance of the site. Council agreed to gather views on this approach from the Manor. The project to install a defibrillator next to the Sulgrave Village Shop has progressed with an updated quote being obtained for the defibrillator cabinet and mounting post and quotes being obtained for the physical and electrical installation. Council agreed to order the defibrillator cabinet and mounting post and to progress with the installation of the defibrillator. Unfortunately, during the time between Council successfully applying for the New Homes Bonus Grant for the installation of the defibrillator and now, there has been a cost increase on some of the cabinet components and other costs not available at the time of the grant application are now known. As a result, Council approved an increase of £500 to the budget for the defibrillator project. Council anticipates that all going well, the defibriallator will be in place by the end of October. Council is currently looking into training for villagers interested in knowing how to use the defibrillator. Enquiries have been made into the experiences of neighbouring villages with static illuminated speed signs. Helmdon reported that they had purchased a solar powered illuminated street sign for £5,000. They felt that, although the sign was expensive, that it has reduced speeding through the village. Council agreed that further research, community engagement and searches for sources of funding should be undertaken on this issue. Councillor Priestman volunteered to take the lead on this work. Council agreed to the bus shelter being used as part of this year’s village advent windows. Council Chairman Chris Jackson met with the General Manager of Sulgrave Manor to discuss the relationship between the village and the Manor. The relationship between the village and the Manor is improving, with the Manor recently hosting the Sulgrave Camera Club. The Manor has developed a business plan which, in part, seeks to increase its income through more events on site. Council will continue to liaise with the Manor as it continues to put into action its plans for the future. Many villagers will have noticed the site works and access that has appeared on Thorpe Road. This site is housing vehicles and staff undertaking preparatory and environmental works for the Sulgrave section of HS2. However, we don’t expect to see major works commence until mid 2019 or later. Ongoing concerns were raised by villagers regarding heavy transport and increases in traffic from commuting personnel. Councillor Faure has arranged for community engagement officers from HS2 to visit the village to answer questions on the 27th of September. You can either attend the meeting and ask any questions that you have at the time, or send them in advance to Councillor Faure. Council has recently sent correspondence to Anglian Water to express its dissatisfaction following a number of water leaks in the village. At this time, no response has been received from Anglian Water. The Salvation Army recently wrote to the Parish Council seeking permission to site a clothing collection bin somewhere in the village. The Parish Council noted that it did not have any land on which a clothing bin could be sited and agreed that it would refer the enquiry to the Parochial Church Council as the Church Hall carpark was the only possible location for the siting of a clothing collection bin. The next meeting of the Parish Council will be on the 4th of October. At this meeting, Council will discuss the Pocket Park pond, Illuminated Speed Sign, HS2 and the Defibrillator Project. committed to following this up with the landowner. A meeting was held with Northants Highways regarding the placement of a replacement street sign. decided to refurbish the existing sign and place it in its previous location. Richard for his work at the Pocket Park and will look to remove the broken seat from the pond area. news, the application for funding to renovate the Church Hall is progressing well. replacement bus services in the near future. able to access the site, the community will forge even stronger links with the village’s heritage. Traditionally, Council does not have an August meeting. The next Parish Council meeting will be on the 6th September. Financial Documents for 2017/18 can be seen on the Parish Council Page. The Parish Council’s June meeting commenced with public participation time. A number of matters were raised for Council’s consideration, including questions about the completion timeframe for the AY4 footpath and concerns about the loss of bus services to the village. In response to these issues, Council has undertaken to enquire about the progress of the refurbishment of the AY4 footpath and to enquire about replacement bus services that may be servicing neighbouring villages. It was also noted that there was very little litter in the Pocket Park of late. Council expressed its thanks to villagers using the Pocket Park for keeping the park clean. Grass reseeding had also taken place on Stocks Green, with the new grass starting to take. Cllr Faure attended a further meeting on HS2. At this meeting, HS2 contractors discussed the expected traffic impacts and their plans to minimise congestion associated with construction. Unfortunately, we are still waiting for the specifics of these plans, including the relevant HS2 contact people and complaints process. The Parish Council will be inviting the HS2 community engagement team to the July Parish Council meeting to consult with the local community about traffic issues. Cllr Daniels reported that after a hiatus, the defibrillator project was continuing. The Parish Council will be moving the project forward and has written to the Sulgrave Village Shop Committee regarding the placement of, and power to, the defibrillator cabinet. The project will progress during the summer and Parish Council hopes that the defibrillator will be in place soon. Northamptonshire Highways has contacted the Parish Council regarding the replacement of the street sign. They have insisted on placing the new sign on Highways land on Stocks Green. The Parish Council will meet with Highways regarding the placement of the sign on Stocks Green to reduce any negative impact upon the green. Council noted that the landlord of The Star Inn would be changing at the end of June. Tom and Chris will be leaving The Star on the 24th of June. Councillors expressed their thanks to Tom and Chris and wish Nikki and Steve the best of luck as they take over the running of The Star. Concerns have been expressed by villagers about the deteriorating relationship between the Manor and village. Council noted that initial discussions had been held with the Manor’s General Manager through the Cllr Jackson. Council was advised that the Manor is currently working on a business plan and that they would be in a position to share this with Council in the near future. Council committed to respond to the plan and provide comment when it is shared with us. At the next meeting, Council will discuss HS2, speeding through the village and the Castle Mound. Agenda for the Meeting to be held on Thursday 7th June at 7.30 pm in the Church Hall. The Parish Council’s May meeting was attended by 5 villagers and commenced with the election of Council office holders. Cllr Chris Jackson was returned as Council Chairperson and Cllr Troy Daniels was returned as Vice-Chairperson. During public participation time, a number of villagers praised the work of the new crass cutting contractors. Commenters observed that on the whole, the grass cutting was being done to a high standard across the village. It was raised that there were some areas on Stocks Green that needed further attention including reseeding. It was suggested that this was an area that villagers could work together to address. The Parish Council and the Parochial Church Council meeting about the funding application for the renovation of the Church Hall was well attended by villagers. Work on the funding submission is also progressing well. 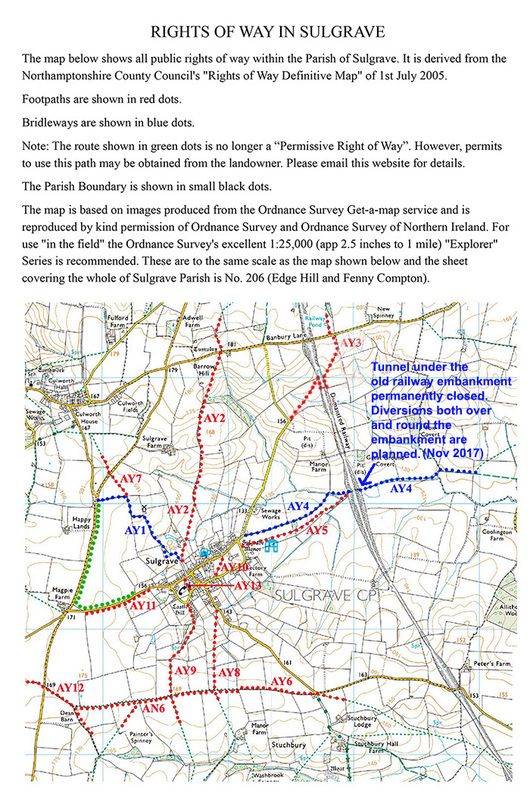 Colin Wooton reminded the Council that up to date information about HS2 can be found on the Sulgrave Village website. Colin also advised the Council that work on the Greatworth intersection is due to start in the Autumn. Cllr Daniels reported on the gravel clearance on Little Street. Around 15 villagers attended the clean up including at least 6 residents of Little Street. A large amount of the loose gravel was removed from the footpaths. Reports about the work have so far been positive. Council offered its thanks to Richard Fonge and all the villagers for their hard work on the day. Council contacted Northamptonshire Highways regarding the replacement of the street sign. They advised that they would replace the sign for free but would place it on Highways land on Stocks Green. It was suggested that this would negatively impact upon the Green and therefore Council will request that the sign is replaced in situ rather than being moved. Council has been advised that the Sigma Sports Cobbler Classic cycle event on the 9th June will see around 300 amateur cyclists travel through the village. There will be signs and marshals posted in the village, but no road closures. While Council supports the event, we will write to the organisers and draw their attention to the need to ensure that any litter is cleared up. At the next meeting, Council will discuss repairs to the bus shelter, seeding of Stocks Green and addressing speeding through the village. See here for the Agenda for the Sulgrave Parish Meeting to be held at the Church Hall on Thursday 5th April at 7.30 pm. After a snowy Parish Council Ordinary Meeting on the 1st of March 2018, there are a few updates that the Parish Council wishes to share with the community. Park Lane Street Sign – The Parish Council is looking to identify an appropriate location for a replacement sign and will also enquire into replacing the street sign on Helmdon Road. Village Bus Services – Concerns have been raised with the Parish Council about the impact of the Northamptonshire County Council’s (NCC) decision to de-subsidise rural bus services. Residents who rely on bus services to the village are concerned about their independence suffering if bus services are eventually discontinued. Sadly, the feedback which the Parish Council had provided on the cessation of bus services during the recent NCC budget consultation fell on deaf ears. However, the Parish Council will make representations to the NCC again on the matter if the opportunity arose. Speeding – concerns regarding speeding traffic both in the village and along Banbury Lane at the 5-ways intersection have been raised and are being considered by the Parish Council. Council will be looking into traffic calming measures within the village and will contact Culworth Parish Council and Thorpe Mandeville Parish Council to explore their concerns about speeding traffic on Banbury Lane. We hope to work with these Parish Councils to identify any potential joint actions to address this issue. Grass Cutting – The new contract for grass cutting in the village has been awarded and will commence in April. Excess gravel in Little Street – The Parish Council contacted Northamptonshire Highways regarding the excess gravel on the footpath and roadway in Little Street. Unfortunately, Northamptonshire Highways advised that although they may sweep the street again, they are not able to give advanced warning of when that may occur. The Parish Council feels that this response is unsatisfactory, and as a result, we will address this issue ourselves. Council will arrange a community sweep of the gravel in Little Street as part of the village litter pick once that has been rescheduled. The residents of Little Street will be advised via a letter box drop so that they can ensure that their cars are not parked on the street during this time. Villagers will have noticed that due to the extreme weather conditions, the village litter pick did not go ahead as planned. However, you should find a revised date in the village newsletter. Council has noted that due to budget pressures at county and district council level, the Parish Council and the community may have to take on greater responsibility for addressing issues in the village. The Parish Council will work to help bring the community together to help address issues where it can. Villagers are reminded that the next Ordinary Council Meeting will be held in May. At this meeting, we will discuss Neighbourhood Watch – with an invitation being extended to the new Neighbourhood Watch Coordinator; and village improvements which the Parish Council can organise and carry out. The next Parish Council Meeting will be held on Thursday 5th April 2018 at 7.30pm. This will be the Annual Parish Meeting. The Parish Council’s February meeting started with an update on actions from January’s meeting. Notably, that Council was awaiting a response from Northamptonshire Highways regarding the grit bin on Helmdon Road and the replacement of the Park Lane street sign. During public participation Council received an update on the Sulgrave Village website. The site has recently been updated and a Parish Council news page has been created to help keep villagers updated. Recent works in the Pocket Park has seen one willow tree felled and limbs that came down in the recent high winds were cut up and burned. The Parish Council will meet with the land owner to discuss felling branches from trees hanging over the boundary fence into the Pocket Park. The Parish Council wishes to thank Richard Fonge for his work in the Pocket Park. Villagers noted that the verge outside of the shop which had been resown last year has again been wrecked by vehicles. Council will look to do repairs in the Spring and explore signage to prevent further damage. Concerns were raised about speeding traffic through the village, particularly along Helmdon Road. Council will investigate traffic management options. Concerns were also raised about the drains outside the shop and pot holes along Magpie Road. Council will report these on Street Doctor, but also encourages villagers to do the same as more reports on Street Doctor may help these issues to be acted upon sooner by the District Council. The Parish Council has met with the Parochial Church Council and the HS2 grant administrators. Council will undertake a survey of villagers to further consult on the proposed project, develop a scope of works and will seek quotes from a range of builders. The HS2 page on the village website will be regularly updated. Advice to date indicates that designs and costing for the Sulgrave section of HS2 will be completed by the end of 2018 with upgrade to the Greatworth intersection to be commenced at around the same time. Council approved funding for four new trees to be planted in the Pocket Park. Council noted that littering seems to be on the rise in the village. In particular, concerns were raised that dog waste was not being taken home by villagers walking their dogs and was being deposited in other people’s bins. Council asks that villagers take their own dog’s waste home with them after a walk and dispose of it in their own bin. Council will also arrange a litter pick in the Spring. The tender for grass cutting in the village has been completed. After examination of the cost, meetings with the tenderers and seeking references, Council resolved to award the tender to a company called Groundcare. This company not only provided the lowest quote, but also had excellent references. Council will seek an April start for the contract and will monitor performance throughout the year. It was good to see the first Parish Council meeting of the year being well attended by villagers. During public participation, it was noted that works to the hedges in the Pocket Park had been completed and three trees felled. The mower for the Pocket Park has been purchased and stored. It will be used to provide additional mowing for the park during the growing season. The ongoing relationship between the Sulgrave Village Shop and the Parish Council was also discussed. An in-principle profit sharing agreement has been struck between the Shop Committee and Parish Council which will ensure that the shop’s rent will remain unchanged into the future, while the Parish Council will share in 10% of the shop’s profits, capped at £350 per year. The Parish Council and Shop are excited to enter this new phase in our relationship and to enhance our shared interests in each other’s success. The Council also offered a vote of thanks to the organisers of the village Christmas Advent Windows. Council also wants to thank everyone who decorated their windows or attended the openings. We look forward to the offerings in 2018! Bus Shelter Project Consultation – Council received a report on the recent consultation on the bus shelter project. Council received 17 submissions during the consultation. Of these, 20% (3) of the submissions were in favour of a Public Works Loan (PWL) to replace the existing bus shelter; 70% (12) of submissions were against the replacement of the existing bus shelter and funding through a PWL while 10% (2) of submissions did not provide a clear indication of either support or opposition. While there had been support in the community for the project, with around a third of households in the village participating in the choice of a replacement bus shelter, this most recent consultation showed significant push back from parts of the community towards the proposition of paying for a replacement shelter through a PWL. On this basis, Council would not be able to evidence the necessary community support for a PWL application. As a result, Council agreed that it would not seek to progress the bus shelter project. Church Hall Consultation – The recent consultation regarding renovating the Church Hall received a favourable response from villagers. This project would see the Parochial Church Council, with support from the Parish Council, apply for a grant from HS2 to renovate the Church Hall. Although there was some misunderstanding as to what could and couldn’t be done with the Church Hall, there was overall support for the project. The Parish Council agreed that it will continue to work with the Parochial Church Council and further engage with Church Hall neighbours, the community, builders and architects to develop a strong grant proposal. HS2 Community Liaison Group – The most recent HS2 update received by the Council indicated that it is unlikely that there will be detailed plans of the part of the route which includes Sulgrave until 2019. Council also noted that the Road Safety Fund for the South Northants section of the project will only amount to £1.65 million over 10 years. A further Liaison Group meeting will be held on 9 February where the HS2 grant funding administrators will provide an update. Should any villagers have specific questions regarding HS2, please contact Cllr Anna Faure. Council’s HS2 Communications Strategy – Council has adopted and is implementing its strategy to keep villagers updated on the progress of HS2. Although there is limited information on HS2 at the moment, information will be posted on the under a HS2 section currently being constructed for the Sulgrave Village website as well as on the Council notice board outside the village shop, as it becomes available. NCC Budget Consultation – The Council has received a consultation request from the Northampton County Council on its second phase of budget cuts. This phase sees budget cuts being made mainly in NCC administration and social care. However, it also indicates that from April 2018, Council Tax will increase by 4.98%. Councillors are currently working through the consultation document to see what impact these proposals will have on residents. A response from the Council will be drafted and sent to the NCC in the near future. Neighbourhood Watch – In the last newsletter, the Council sought a volunteer from the village to act as our Neighbourhood Watch Coordinator. Luckily, Council did receive an enquiry about the position. Following clarification of the role from the regional Neighbourhood Watch people, we hope to have a new Neighbourhood Watch Coordinator and scheme for the village. Grit Bins – Council noted that Northamptonshire Highways had, possibly mistakenly, replaced a grit bin on Manor Road. Council also received correspondence from Northants Highways that that they had assessed the destroyed grit bin on Helmdon Road and has determined that it did not require replacing. Council will write to Northants Highways to again highlight the poor state of this grit bin and request that this bin also be replaced. Council noted that as part of their recent budget consultation, NCC is proposing to cut grit replenishment services. Council agreed that keeping the grit bins replenished was essential for the village during winter and committed to include this in the 2018 budget. Grass Cutting – Council received 3 tenders for the village grass cutting contract. These varied significantly in cost, but nearly all exceeded the amount Council had previously budgeted for grass cutting. As a result, Council agreed to work with the tenderers to seek a better deal and to increase the budget amount for grass cutting (by reducing budget allocations in other areas). Council also agreed to contribute £150 to support the servicing of the church clock. Budget – The Council budget for 2018 was also greed. This will see the Council’s precept increase by 2.5% to £13,800. This modest increase is in line with inflation and will help the Council to meet the increased grass cutting costs, the cost of replenishing the grit bins next winter and the cost of repairing and maintaining some of the village assets. Other Matters – The Council will be organising a village ‘Clean Up Day’ in the coming weeks to help shift leaves, pick up litter and tidy the village before Spring. More information on this will soon be available on the village website and on the Council notice board. Finally, to help villagers get to know their Parish Councillors, we will be placing short biographies of each Councillor, including their picture and contact details, on both the village website and in the Parish Council noticeboard outside of the shop. To keep villagers updated on the work of the Parish Council, we will publish a summary of each meeting in the following month’s newsletter. The November meeting was well attended by villagers who raised a number of issues during public participation. In particular, a concern was raised that there were a number of places in the village where plants and trees were overhanging footpaths creating safety issues. With the cold weather and shorter days already here, villagers are asked to cut back overhanging tree branches and plants so that pedestrians do not have to walk on the roads or slippery verges. Council business discussed at the meeting included: Replacing the bus shelter; Pocket Park maintenance; grass cutting; HS2; Neighbourhood Watch; and the 2018/19 budget. Replacing the Bus Shelter – The existing shelter has been in place for over sixty years and will become structurally unsafe eventually. Its replacement has been an agenda item for the Council for a number of years. In July, villagers chose a new shelter to replace the existing one. Council discussed the cost of replacing the existing shelter and agreed to apply to use the remaining New Homes Bonus Grant to part fund the new shelter, while the Sulgrave History Society offered to contribute financially to the project. It was agreed there are insufficient reserves to draw upon and the whole shortfall cannot be added to the precept. It was agreed that Council would investigate funding the remaining costs through a public works loan. Councillor Daniels continues to lead on this project. Pocket Park – Councillor North provided an update on maintenance carried out at the Pocket Park. It was agreed that the hedging work carried out by Mr Richard Fonge last year would be continued and would commence in December. Council agreed to a proposal by Mr Fonge to purchase a mower and fund more regular grass cutting for the Pocket Park. The total cost of acquiring the mower and grass cutting will be added to the Parish Council’s 2018 budget. Grass Cutting – The grass cutting contractor has advised they will be unable to continue with the contract from the end of the season. Council will now undertake a tender to appoint a new contractor. HS2 – Following the successful HS2 consultation visit to Sulgrave in October, Council discussed and adopted a strategy to ensure that villagers were kept up to date with HS2 developments throughout the design and construction process. Council will keep villagers up to date through this newsletter, the village website and on the notice board as information on the progress of HS2 becomes available. Once more information comes to hand, Council will arrange another information event. Counsellor Faure will attend the SNC HS2 Liaison meetings. The Parish Council is strongly committed to working with villagers to try to mitigate the impact of HS2 on the village. Neighbourhood Watch – Council discussed and agreed the benefits of a Neighbourhood Watch scheme in the village. While it was noted that Neighbourhood Watch schemes are moving more online, if we are to establish a scheme in the village, we will require a Neighbourhood Watch Coordinator. To date, there have been no volunteers for the position of Neighbourhood Watch Coordinator. Council will be seeking a Neighbourhood Watch Coordinator over the coming weeks. Other business – Council discussed setting the 2018/19 budget. Council agreed to keep the 2018 precept as low as possible by limiting increases. The 2018/19 budget will be decided next meeting. As there is traditionally no Parish Council meeting in December, the next meeting will be in January 2018. At this meeting, Council plans to receive an update on the bus shelter project, set the precept for 2018/19 and receive an update on HS2 and Improvements to the Church Hall.